The Invisible Worlds exhibit was born from an idea by New York-based scientist-turned-designer Amanda Phingbodhipakkiya that grew into an organization called The Leading Strand. Her vision is to make complex scientific concepts more accessible to laypeople by pairing scientists and designers to tell the story of the scientists’ research. Amanda Phingbodhipakkiya (left), a New York-based scientist-turned-designer, worked with NC State scientists and designers to tell the stories of the scientists’ research. Phingbodhipakkiya selected NC State for the second cohort of The Leading Strand after being impressed with her experience during a visit to campus last year to deliver a talk on her work. Each team was tasked with producing a physical or digital installation that could help the public interact with the scientist’s research. Explore these installations in the videos below. The lead design and science faculty, along with their teams of students, met regularly throughout the spring semester to flesh out their concepts. Phingbodhipakkiya spent the spring as a visiting faculty member in the College of Design and offered biweekly check-ins, demo days and regular reviews to help each team hone their concepts. The first challenge for each team was getting on the same page about the scientific concepts they were presenting. Sara Queen, associate professor of architecture, already had a frame of reference for the science behind her team’s project. She and her students worked with Karen Daniels, a physicist who studies packing and force transfer in granular materials. These concepts underlie decisions architects must make about structures based on the type of soil they’re building on. It’s crazy that some people think science isn’t creative. Knowing how to ask the right questions in science is a form of creativity too. Assistant professor of physics Lex Kemper, whose work deals with manipulating time to observe condensed matter and other phenomena, used visual and experiential reference points to introduce his design partners to his work. He also brought the designers into physics labs to help give them a clearer idea of what physics research involves. The scientists and designers became more familiar with each other’s work through the collaborative process. In doing so, they noticed that they weren’t actually that far apart. While each team worked through iterations of their final concepts, Phingbodhipakkiya and Mira Abed, the College of Sciences public science liaison, worked to find the perfect space to bring the exhibit into the public sphere. They found it in the new Transfer Co. Food Hall, a converted warehouse space that will house a range of popular Raleigh food vendors. Creating an interactive experience that’s both fun and educational was especially important because the unconventional venue offers a chance to attract visitors who don’t normally go to art or science museums. 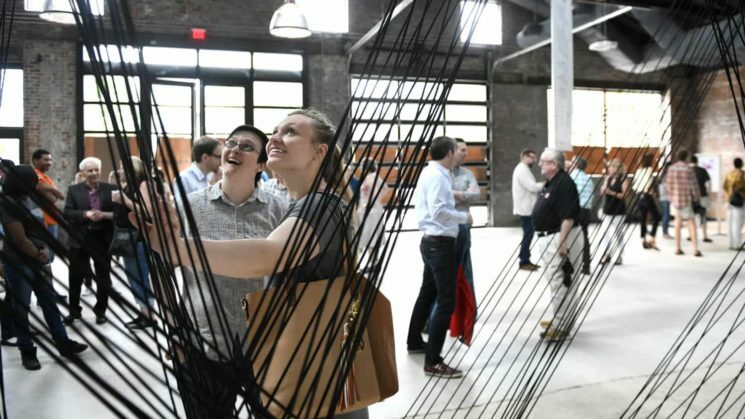 Hundreds attended the May 18 exhibit preview at the Transfer Co. Food Hall, a converted warehouse space in downtown Raleigh. At the event, attendees said they appreciated this chance to experience something new. Kemper emphasized the participants’ hope that the exhibit will inspire attendees to think differently about science. “I hope the people who see this come away with the desire to learn something more and look at the world around them with different eyes,” he said.